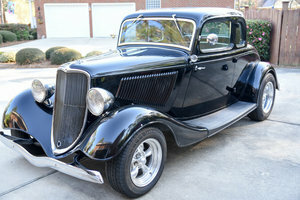 1931 Ford Coupe has had a total frame off restoration. Engine is Ford 302 cu.in. with 347 cu.in. stroker kit. Transmission is C4 Ford automatic. Wilwood front disc brakes. Paint is Mercury Black Cherry. Interior is brown leather. I have 4 pages detailing what went into this complete build.